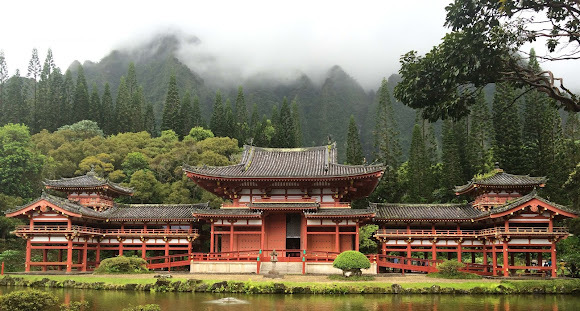 Located in the Valley of the Temples Memorial Park, the Byodo-In Temple is something I've seen in numerous pictures and always wanted to visit. Our family finally visited this majestic temple recently, as it was a stop on our Custom Tour with Circle Island Tour in 24. 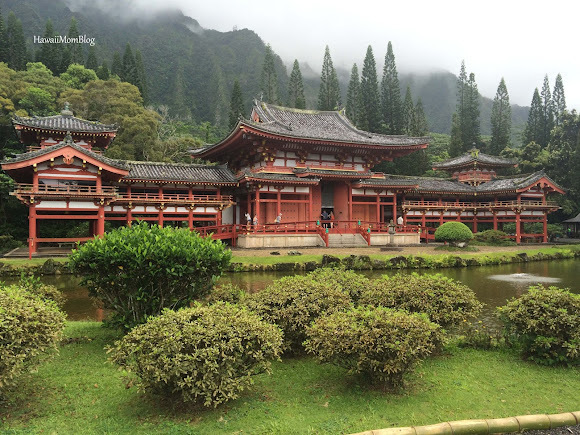 The Byodi-in Temple is a small-scale replica of the Byodo-in Temple in Uji, Japan, but it still leaves a big impression on all who visit. Crossing the bridge to the temple grounds was like stepping into another place and time. The impressive, vibrant red structure sitting amongst the lush, green trees with the mist-covered mountains in the background was quite awe-inspiring. The bell is customarily rung before one enters the temple to spread the eternal teachings of Buddha. Ringing the bell will purify the mind of evil spirits and temptation. It is said that ringing this bell will bring you happiness, blessings, and a long life. It is customarily rung before entering the temple. 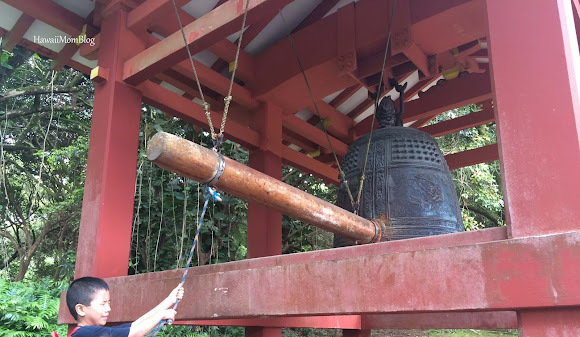 Each of my kids excitedly rang the bell, which echoed throughout the grounds as we walked to the temple. 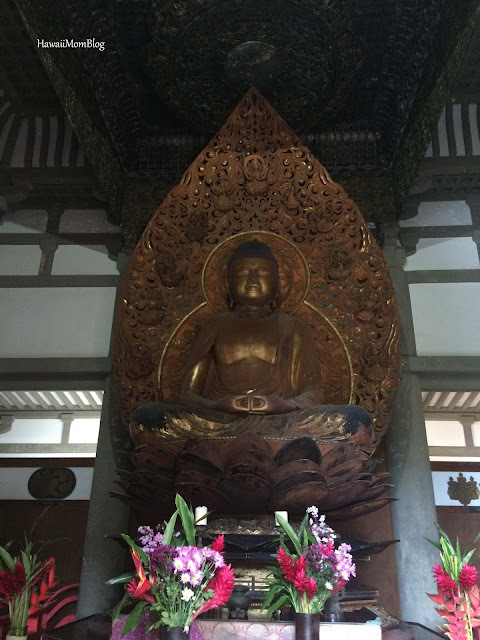 Inside the temple's central hall is the Amida Buddha. Amida Buddha was created by Masuzo Inui, a famous Japanese sculptor. The 9-foot tall Buddha beckons both worshippers and those who simply want to admire the intricate artwork. On the grounds of the temple you'll find black swans and koi, and there are signs cautioning to stay away from the wild peacocks, but we didn't see any. 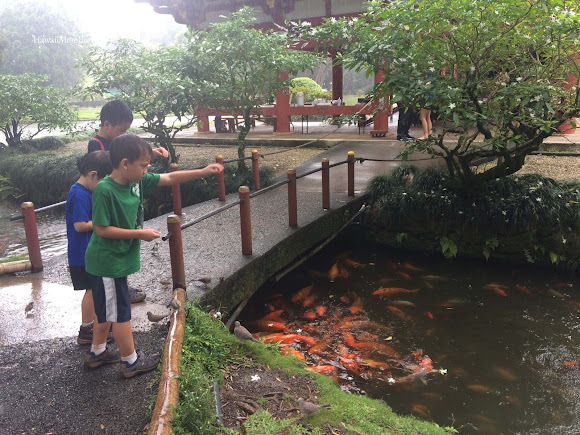 If you go to the gift shop, you can purchase some fish food to feed the koi. Although there were a lot of people visiting (the small parking lot was filled with cars and others waiting for stalls), there was still a sense of tranquility. 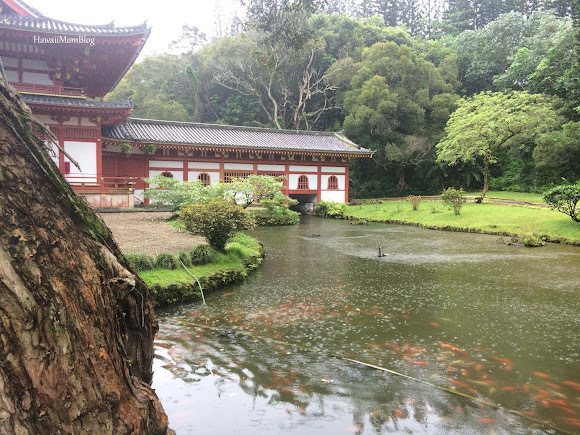 We were at Byodo-In Temple for just a short time, but whether you stay for just a few snapshots and a quick tour the temple, or you linger longer to reflect or even meditate, the temple and its grounds will undoubtedly instill a feeling of wonderment. 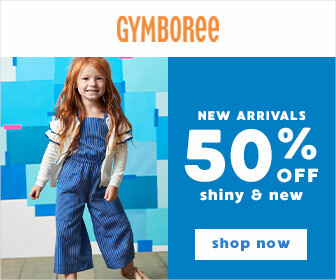 Admission is $3 per adult; $1 per child; $2 per senior citizen. Do you have a list of places you visited in on your independent Circle the Island tour? 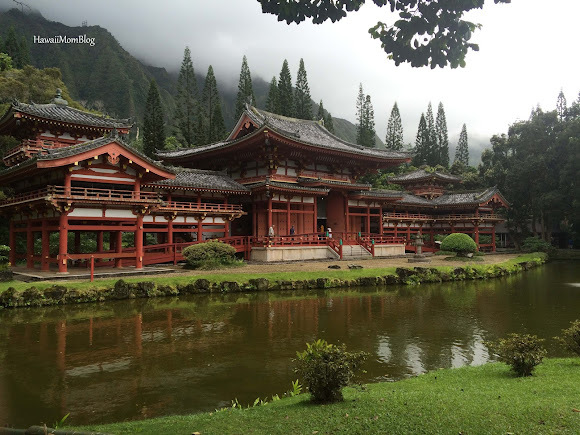 I will do a roundup of all places and an overall review in a couple of weeks, but for now you can check http://www.hawaiimomblog.com/search/label/circle%20island%20tour%20in%2024 for the places I've posted about so far. 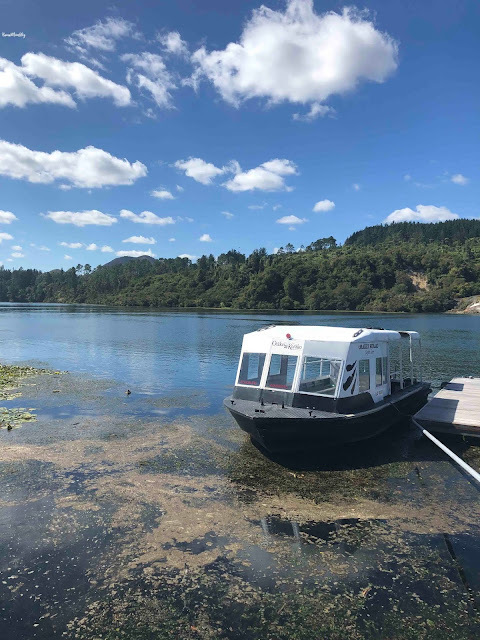 Dan (the owner) is very accommodating, and if you have places you want to visit, and/or want him to provide you with suggestions, he'll work with you to figure out the best itinerary.